Our Humans of NABA series continues, with the National Butterfly Center’s groundskeeper and educator, Alexander R. Meza! Six years ago I was a sales representative getting paid ten dollars an hour selling home décor internationally, inside an air conditioned office. Living inside for half a decade I became depressed and unsatisfied. My mind and body were thirsty for something new, something exciting. One day a good friend of mine mentioned a bird walk at the National Butterfly Center and, thinking nothing of it, I decided to give it a try. The next day I chose to return to work and immediately announce my two-week notice. It’s been almost one year, now, observing nature and all its wild creatures. Feeding Green Jays and fox squirrels every morning with wild seeds and making fresh banana brew for the emperors and crackers in the hackberry trail. Working at the National Butterfly Center and with the Captain has awakened my passion for nature photography and has changed my life. It feels great tending to a plant and talking to it only to see it bloom for you the very next morning. I believe that nature is my therapy. 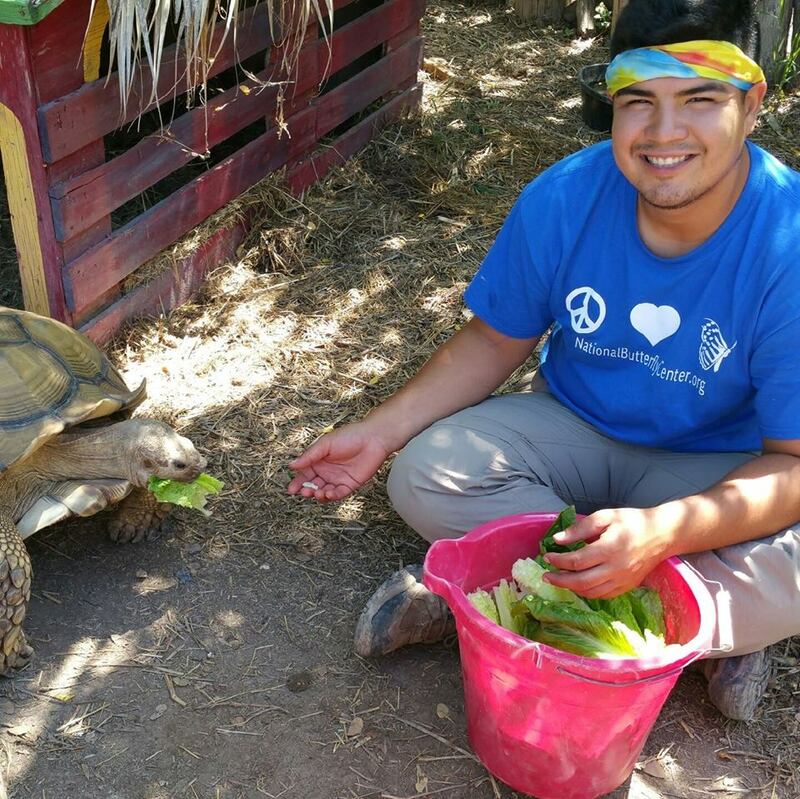 I feel spiritually connected to the plants and wildlife, and I feel God led me to volunteer here, which ultimately led to my permanent job. I love having picnics under the Monarch Palapa and seeing all the chachalacas and queens circle around me. My goal is to travel not only South Texas, but the world photographing wildlife. I dream of capturing something no one has ever seen before with my camera. I want to go back to school and get a degree in ornithology and be known for environmental conservation. I hope to one day help the people of South Texas wake up and realize that the Valley is not a boring place, but a wonderful, magical place full of insects, mammals, colorful birds and reptiles. I am doing my part to protect this land for future generations to come. Me and my camera will change the world. The Broward County Butterfly Chapter, BCBC, invites you to their Nov 15, 2016 meeting. Rose Bechard-Butman presents “How to Create a NatureScape, a Habitat to Attract Wildlife and Butterflies.” Rose is the NatureScape Broward Outreach Coordinator; a Certified Arborist; a Master Gardener and National Wildlife Habitat Steward. She serves on many local boards and organizes programs and community projects that support sustainable landscapes and wildlife habitats. Meeting starts: 7pm, social hour: 6.30pm at the Broward County Extension Office, 3245 College Ave., Davie, FL 33314. For further info visit our website: www.browardbutterflies.org or email BCBCmail@gmail.com.